While walking past the kitchen, Mago saw Seneca sitting there, chewing slowly, eyes glazed over, and stopped to laugh. “Looks like Ally did a number on you!” Seneca grimaced. “I’m glad to help her out, but I’ve got to admit this is more work than I thought it’d be.” “That’s ghosts for you - they don’t have any concept of stamina!" Neopia is a fantastical world, filled with wonders and excitement. However after a while you realize that doesn’t mean it’s free of worries. Whether you just heard tales or had your own experience, Neopia has many malicious monsters and grim ghosts hiding around the corner. However we have ways of fighting off the daily terrors such as the Pant Devil or Shadow Usul. But those are evils we know about, what about the ones we don’t? Or, more specifically, we did know about? With so many monsters some were bound to vanish from the public eye. What happened to them? Where are they now? And can they become a possible threat again? Hello dear readers. This article was specially written for the Ghosts and Monsters issue and therefore features some of the most legendary villains in the entire Neopia world. 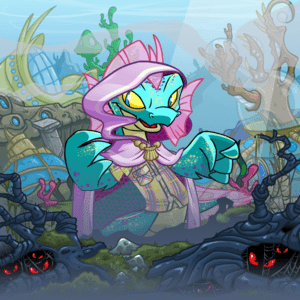 The purpose of this article is not to criticize or demean Neopia's villains, instead it's written for admirers of these creatures. If you are not a fan of spooky beings you would better stop reading from this point. Still with us? Great, then read on to hear the backstory about six great evil characters. And since Halloween is very near, this article also contains some suggestions on how to customize your pets based on these infamous characters. Grab your Evil Popcorn and start reading! Note: The following was found on a scrap of paper attached to the bark of a tree near Neopia central. It has been posted here for informational purposes. Be aware, we are not sure of its truth, as the events depicted are difficult to confirm. However, if true, it paints a chilling picture. Professor Lambert was at his wits' end, and with as much wit as he had that was a place he rarely found himself. All day he had been interviewing applicants for a job sorting books in the Seekers' library. No one who had come in so far seemed right for it. The last applicant had actually walked in eating Cheesy Neos, and Lambert had had to frantically prevent him from touching anything with his messy fingers. Having shooed the fellow out, the Gnorbu sat at his desk and wearily buried his head in his hands. "Er, may I come in?" asked a female voice. "Yes," Lambert replied. He couldn't help but wonder why she didn't simply knock like everyone else. "Oh, hello. I'm Cordeilla Earnshaw." The professor looked up, startled by the sudden nearness of the voice; he hadn't heard the door open. Standing before him was a young Ixi woman... and she was a ghost. He wasn't scared, just shocked. He was intelligent enough to realize that ghosts were generally harmless... it was the zombies you had to worry about. "I hope you don't mind that I didn't knock," the Ixi continued. "I tried to, you see, but I had a little trouble. Me hand went right through the door!" She let out a loud guffaw. Lambert gave a nervous chuckle and a small, uncomfortable smile. "Er... what can I do for you, Miss Earnshaw?" 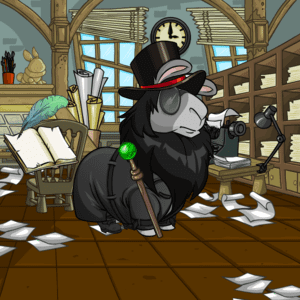 "I'm here to apply for the book sorting job you advertised in The Neopian Times." "And in what ways do you feel you are qualified for the position?" "Not much to be qualified for, is there? I know how to put things in order. I can read and write and all that. I learned that when I was in school in Neovia. I'm originally from there, y'see. I was in theatre but me career got cut short. I've always been a bit bookish, though, wantin' to learn. Oh, and there is one other thing I feel I must mention." This week, we’re adventuring through graveyards and avoiding spooky creatures to get in gear for this ghostly season. Mutant Graveyard of Doom is one of those fun games that combines problem solving and adventure.